The largest return of highly enriched uranium (HEU) research reactor fuel in the history of an initiative to return the fuel to its country of origin has been completed, with the removal of over 450 kg of HEU fuel from Poland. The US Department of Energy's National Nuclear Security Administration (NNSA) announced the completion of the project, which involved five shipments over 12 months to return the fuel from Poland's Ewa and Maria research reactors to Russia. As well as being the largest fuel return campaign, the project also included the largest single shipment of spent HEU fuel in NNSA's history of 187 kg. The fuel came from two reactors, Ewa and Maria, at the Polish Institute for Atomic Energy's (Polatom) nuclear centre in Swierk. Ewa operated from 1958 to 1995. Maria, which started up in 1974, is the country's only operating research reactor. Earlier this year, Polatom signed agreements with US healthcare supplier Covidien to supply it with the medically important isotope molybdenum-99 produced in the reactor. Maria underwent major refurbishment in 1985. 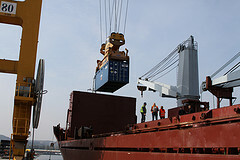 Each of the five shipments saw the packaging of the material into internationally licensed transport casks, which were then secured in shipping containers and taken in an armed convoy from the reactor site to a nearby railway station for transfer by rail to a seaport for transport to Russia. The entire fleet of spent fuel transportation casks used for Russian-origin HEU were used in the operation. The shipments were made under NNSA's Global Threat Reduction Initiative (GTRI), which aims to reduce and secure vulnerable radioactive materials held at civilian sites around the world. Many of the world's research reactors were originally built to run on HEU fuel – that is, enriched to over 20% uranium-235. However, HEU fuel presents a possible proliferation risk, as uranium at 20% enrichment could potentially be used to make a crude nuclear weapon. Since the late 1970s, international efforts have sought to reduce this risk by converting research reactors to low enriched uranium (LEU) fuel under the Reduced Enrichment for Research and Test Reactors (RERTR) program and repatriating spent and unused HEU fuel to its country of origin - either the USA or Russia - for secure storage and ultimately disposal. The US organisation boasts a long history of cooperation with Polatom, including technical cooperation towards preparation for the conversion of Maria to LEU fuel. The latest campaign has seen the completion of the removal of all HEU from Ewa and from the spent fuel storage building at the Swierk site, NNSA notes. "This major milestone brings us one step closer to achieving President Obama's goal of securing all nuclear material around the world within four years," NNSA administrator Thomas D'Agostino remarked, referring to pledges made by some 47 nations at the Washington summit on international security in April 2010. NNSA's completion of the latest Polish HEU shipment coincided with the 32nd annual international RERTR meeting, taking place in Lisbon, Portugal.